Pasadena Memorial High School R.N. 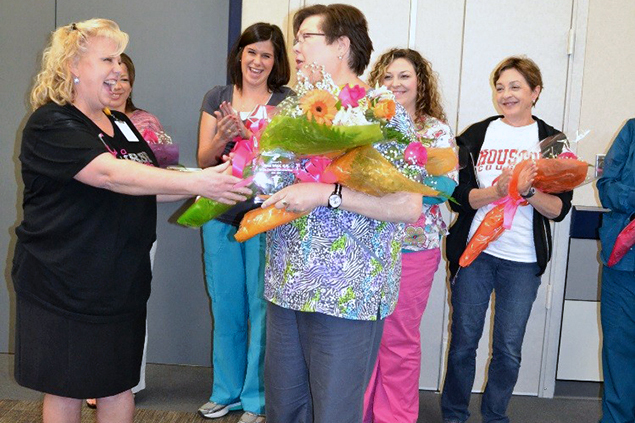 Renee Welch receives flowers from April Weisdel, district nurse specialist after being name Pasadena ISD's 2014-15 Health Care Professional of the Year. Pictured: Nominees for the award: Sylvia Moreno, Gardens Elementary; Heather Shirley, Milstead Middle School; Ashleigh Morris, Fisher Elementary; Colleen Hicks, Sparks Elementary; Nicole Seymour, Teague Elementary; Renee Welch, Pasadena Memorial High School; and Misty Harrison, Garfield Elementary. Not pictured: Debra Blum, Red Bluff Elementary. When it comes to improving the safety, health and wellness of students and staff, school nurses are considered superheroes. For the first time, Pasadena ISD is honoring a school nurse as the Health Care Professional of the Year. This individual demonstrates excellence in the nursing practice, advocates for students ensuring that every opportunity is provided for them to receive health care services and makes outstanding contributions to the health and well-being of students and staff in the district. The honor went to Renee Welch, registered nurse at Pasadena Memorial High School. All nominations were reviewed by a committee. According to district nurse specialist April Weisedel, Welch had not only met the criteria, but exceeded all expectations. A longtime resident of Pasadena, Welch attended all Pasadena ISD schools including South Shaver Elementary, Southmore Intermediate and Sam Rayburn High School, where she graduated in 1977. Welch graduated from the Texas Woman’s University in 1981 with a Bachelor of Science degree in nursing and general sciences. Shortly after college, she began her nursing career at Park Plaza Hospital as the medical, surgical, E.R. and house supervisor. She later transitioned into nursery care at Jefferson Davis Hospital where she worked in transitional care, NICU and served as director of low birth weight and premature growth and development. Welch returned to her Pasadena ISD home in 1992 as the school nurse at Williams Elementary, then Park View Intermediate and Pasadena Memorial where she currently serves as the lead nurse. Her accomplishments have not gone unnoticed.